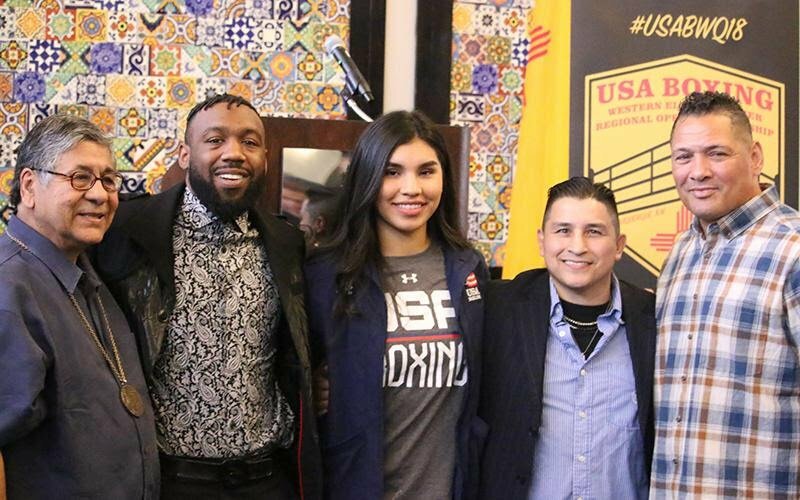 PAST & PRESENT of USA Boxing: (L-R) 1972 Olympic bronze medalist Jesse Valdez, 2004 U.S. Nationals champion Austin Trout, future Olympic hopeful Sharaha-Taina Moreu, 2-time world (pro) champion Danny Romero, and 1984 Olympic silver medalist Virgil Hill. COLORADO SPRINGS, COLO (May 31, 2018) – USA Boxing has declared June as its “Alumni Association Membership Drive Month”. Chris Cugliari and John Scully will oversee two USA Boxing Alumni Association tables at the International Boxing Hall of Fame Induction Weekend, June 7- 10 Canastota, New York, during the its golf tournament and Memorabilia Show. USA Boxing product Winky Wright (51-6-1, 25 KOs), a two-time junior middleweight world champion, is one of only three boxers being inducted into the IBHOF Class of 2018. Multiple world champion as a pro and 1984 Olympic silver medalist, Virgil “Quicksilver” Hill, three-time Fight of the Year participant “Irish” Micky Ward, world champions Riddick Bowe, Junior Jones and other “Alumni Association” members are expected to make supportive appearances. The Alumni Association drive will continue June 24-30 in Charleston, West Virginia during the 2018 Junior Olympics, Prep Nationals and Youth Open. The USA Boxing Alumni Association is open to anyone who has a love for boxing and would like to stay connected with amateur boxing. Members are granted access to a wide variety of special events host by the Alumni Association.